At some time in my distant past I inherited a light brown corduroy jacket from my dad. I remember him wearing it, but don’t know why I ended up with it. I may have been a teenager. I may have worn it when I first got it, but I never threw it away. Dad, Kevin and me in Chetek. A few years ago I found the jacket in a box of stuff in our attic kneewall. I pulled it out to see if Clare wanted it. She didn’t. It’s been sitting around for a number of years, sometimes in the closet, sometimes in a box, occasionally on the coat rack in my bedroom. A few months ago I debated throwing it away, so I tried it on. It felt like a hug from my dad. No way was I getting rid of that. It is very worn, has rust stains and is fraying at one wrist. But it is soft and warm. 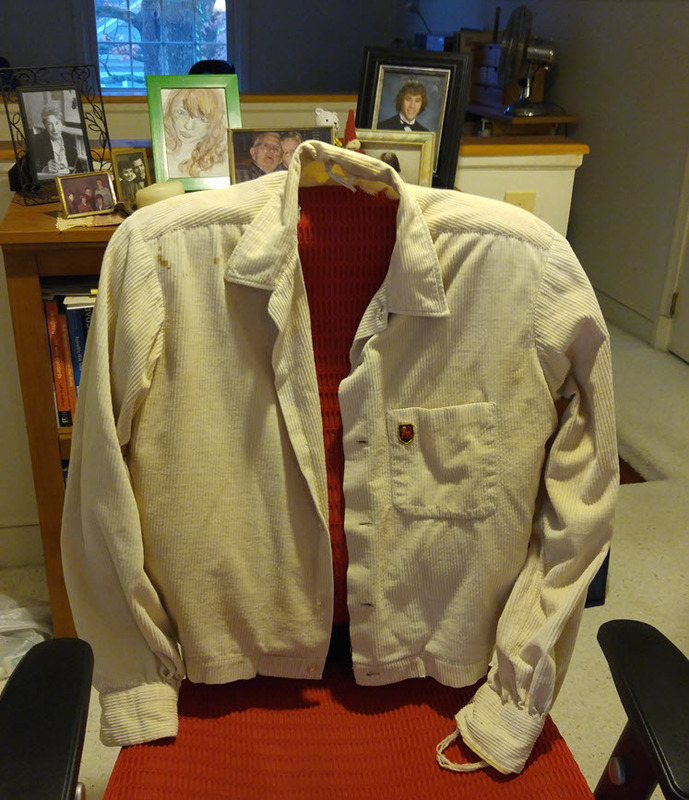 These days it hangs on the back of my work chair and when I get chilly in my office attic I sometimes put the jacket on. For the first few seconds I can feel my father’s presence. Such a good idea to have it in your office.